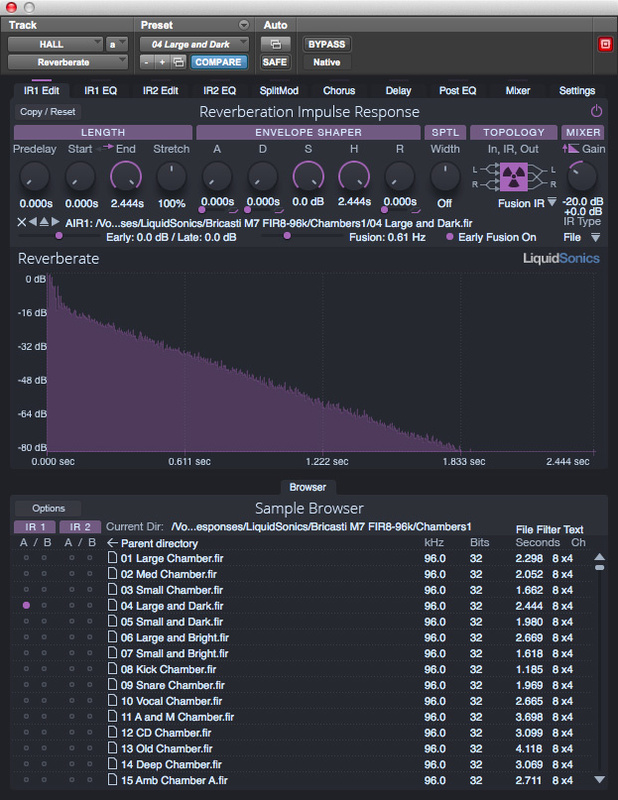 When I reviewed Liquidsonics’ Reverberate, back in 2010, it stood out for a couple of reasons. It was priced very attractively, at a time when most real-time convolution plug-ins were premium products commanding high price tags; and at a time when convolution was attracting negative feelings for its supposed static, flat quality, Reverberate incorporated real-time modulation features designed to restore life to the plainest of impulse responses. Seven years on, these qualities are no longer unusual. 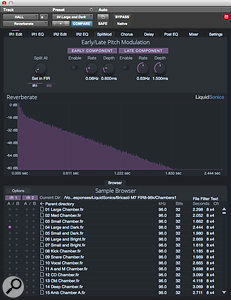 Convolution reverb has generally become more affordable, and most convolution plug-ins now incorporate ways of adding movement and liveliness to their output. 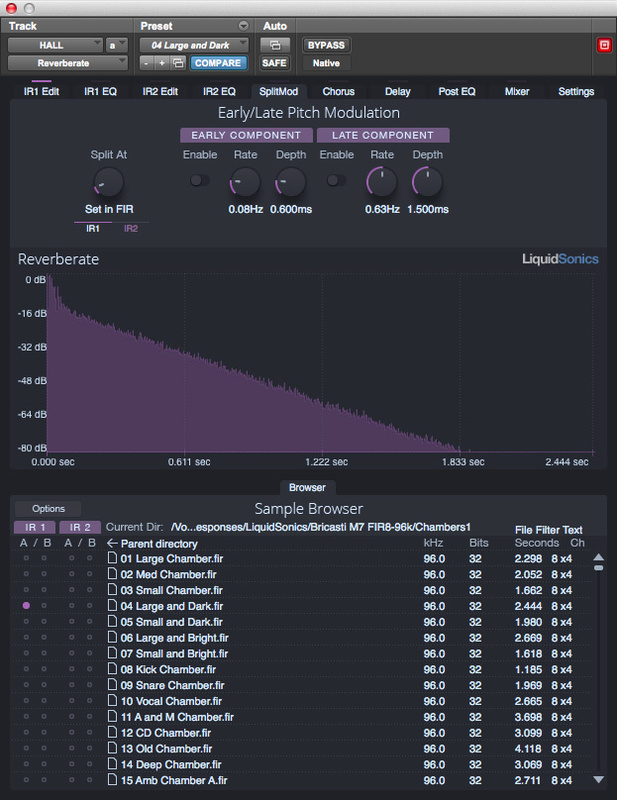 So, to keep version 2 of Reverberate ahead of the pack, developer Matthew Hill has struck out into unknown territory with a new feature that he calls Fusion-IR. One feature of the new technology is immediately obvious when you download Reverberate 2. Despite containing about twice as many presets and IRs as the original, the factory library clocks in at under half a gigabyte. The separately downloadable Bricasti Fusion-IR library, by contrast, is more than 5GB in its compressed state, and unzips to a chunky 10GB. I guess that’s what you get when you sample a lot of long reverbs lots of times, in true stereo, at 96kHz. Fusion-IR technology is, incidentally, different from the dynamic convolution used in programs like Acustica Audio’s Nebula, the former being intended primarily to capture time-variant rather than dynamically non-linear sources. 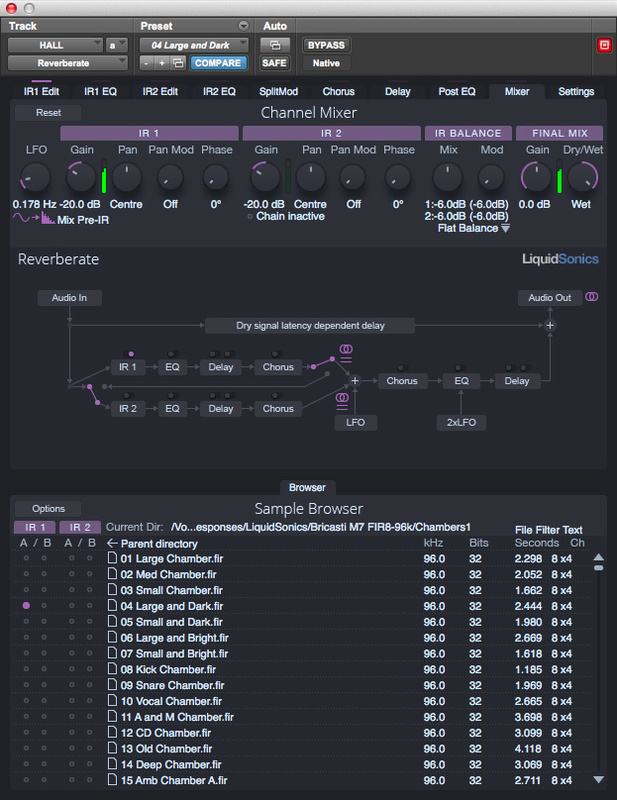 Compared with other current offerings in the reverb market, Reverberate 2’s user interface is decidedly utilitarian, with no pretty photos of cathedrals or exotic 3D waterfall plots; the only concession to aesthetics is a choice of different colour schemes. It’s also rather on the small side given the number of parameters available, but as long as you can read the slightly pokey text, everything is functional and easy enough to get to grips with. When you have two impulse responses loaded into Reverberate 2, you can specify split points and modulate between the early and/or late sections of two IRs independently. Reverberate’s very comprehensive controls are divided logically between 10 tabbed pages. Each instance can load two impulse responses, and not only can you apply the usual time-stretching to tweak the reverb time of each, but there’s a full ADSHR envelope, plus separate control of pre-delay. There are also extensive routing and modulation options, including built-in chorus and delay, plus three separate equalisers — one for each of the IRs and a global output EQ. Each of these equalisers has five highly configurable bands, and various of their settings can be modulated, allowing the spectral balance of each IR or the reverb as a whole to change over time. One of the main innovations in version 1 of Reverberate was the ability to use an LFO to modulate the pitch of the loaded IRs. That has now been extended further thanks to the introduction of a user-defined split point which divides each IR into ‘early’ and ‘late’ portions. Modulation can now be established independently for each of these, so you could, for instance, combine a stable, fixed balance of early reflections with a tail that incorporates pronounced motion. The new Fusion-IR technology takes this basic splitting-and-modulation idea and runs with it. For one thing, not only are all the impulse responses sampled multiple times, but in a Fusion-IR, the early and late components of the sound are actually sampled independently. And on top of the pitch modulation described above, there’s a separate rate control which adjusts how rapidly the modulation between these component IRs occurs. You can also adjust the relative balance of the early and late components within the IR Edit page, and disable Fusion modulation for the early component if you prefer. Six years is a long time in plug-in land, and development on Reverberate has been ongoing throughout. As a consequence, a whole host of other smaller features has also been added since we last looked at it. For instance, it’s now possible to adjust the stereo width of impulse responses, or deploy Reverberate 2’s ‘True-stereo Simulation’ technology to approximate a true-stereo reverb from a conventional stereo impulse response (true-stereo operation requires separate stereo IRs for the left and right input, which aren’t always available). If you so wish, the early and late components of an IR can independently replaced with synthetically generated impulse responses, or you can add ‘sheen’ to dull-sounding spaces by blending in an IR with the same amplitude envelope but a flat frequency response. Ten tabs’ worth of in-depth control adds up to several hundred fully automatable parameters, but in practice, you don’t need to touch most of them. If, like many people, your interaction with reverb plug-ins usually amounts to setting the pre-delay and rolling off some high or low end, that’s eminently possible here. Alternatively, if you do want to roll up your sleeves and fine-tune every last reflection to the nth degree, a couple of hours’ experimentation and some time spent with the excellent PDF manual will have you flying solo before long. Any convolution reverb is, at root, only as good as the impulse responses you load into it. The selection that was supplied with the original Reverberate back in 2010 was effective but pretty basic, reflecting its low cost; to get the most from it, you’d need to scour the Internet for third-party IRs, or bring out the starting pistol and capture your own. Reverberate 2 is a different story. The signal flow diagram in the mixer page gives some clue as to the depth of processing on offer here! First of all, there’s that library of M7 presets. If Bricasti’s thinking in tolerating the distribution of impulse responses of their reverb is that it acts as the best kind of free advertising, all I can say is that it definitely worked for me! Not having heard an M7 before, I had naively assumed that hardware would no longer have much of an edge over the best algorithmic software reverbs. I was wrong, because these sounds have a richness and complexity to them that I’ve not heard even in high-end plug-ins like Lexicon’s PCM Native bundle. The 10GB Fusion-IR library covers all bases — ambiences, chambers, rooms, halls, plates and more — and there are no real weak links. Some of the chambers in particular are stunningly good, while anyone working with acoustic music will embrace the halls with tearful gratitude. The modulation within the Fusion-IR presets is not of the cartoonish, make-you-feel-seasick type, but of the sort you only notice when it’s not there and the reverb is suddenly less involving. I can’t judge how closely the Fusion-IR process captures the nuances of the original, but it certainly made me want an M7 very much. In the meantime, though, we’re talking about a free add-on to an £80 reverb plug-in, and I’m pretty sure reverb of this quality has not previously been available at such a low cost. I should also point out that Matthew has put a lot of work into optimising his code; even though the Fusion-IR presets require simultaneous convolution of eight true-stereo files, and Reverberate defaults to zero-latency operation, CPU load was never an issue for me. The rest of the factory library is perhaps not as striking, but is by now quite comprehensive, and includes more than a handful of presets that I liked a lot. The plain ‘Concert Hall’ and ‘Concert Presence’ seem to lend themselves to almost anything, while some of the theatres and studios likewise make for highly effective general-purpose spaces. Some of the more characterful IRs are interesting and useful too, and though other reverbs perhaps offer a wider choice of snare drum or rock vocal reverbs, if your needs are mainly for realistic acoustic spaces, you’ll go a very long way with what’s on offer here. My only real gripe is that the Bricasti Fusion-IR presets are all much louder than those in the factory library, making it hard to compare them directly. All in all, though, at the asking price, Reverberate 2 is an absolute bargain, and will only seem more so when further banks of Fusion-IR presets become available. Matthew plans to make public the details of the file format soon — albeit with the ominous warning that “some familiarity with tools like Matlab/Octave or Python will be required” — so hopefully we’ll see other people joining in the fun too. Until my lottery numbers come up and I can afford that M7, I’ve no doubt that Reverberate 2 will be seeing a great deal of use in my mixes. Most convolution plug-ins now incorporate ways of manipulating impulse responses and adding modulation, but not in ways that are directly comparable to Reverberate 2’s Fusion-IR technology. The focus in HOFA’s IQ-Reverb and Overloud’s Rematrix, for example, is more on recreating vintage-style and processed reverb sounds than on faithfully capturing the nuances of a high-quality algorithmic reverb. An incredibly well-featured convolution reverb at a bargain price. New Fusion-IR technology overcomes many of the limitations of convolution. Superb free library of Bricasti M7 impulse responses. Highly optimised code for low CPU load even at zero latency. A larger or resizable user interface would be more friendly. You’ll want to buy a Bricasti! 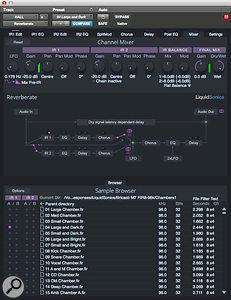 Behind the plain exterior of Reverberate 2 lurks a hugely impressive convolution reverb, which offers new levels of realism in recreating time-variant sources. £80; upgrade from v1 £35. No VAT applicable in the UK. £80 (approximately $125); upgrade from v1 £35 ($50).